As the cold and dry winter weather sets in, our skin can be irritated due to daily exposure to cold and dry climate. Indoor does not offer much relief as heaters can excessively dry the skin. The winter skin can easily turn stiff and develop pruritus and other skin conditions. Aging can accelerate if the skin is left uncared for in these harsh conditions of winter. I would like to suggest Fox Peel as a remedy for winter-related skin troubles. Fox Peel allows customization to various skin types as well as individual patient needs. It effectively removes keratin build-up and resolves skin troubles by delivering antioxidant substances and multi-hydration action to deeper layers of the skin. Fox Peel is comprised of three peeling agents of ACLESS, MELALESS, and AGELESS and two therapy agents of Bubble C Snow and Oxygen Booster (vitamin C oxygen therapy). It allows customization of skin care program for various skin conditions including acne, pigment, aging and whitening. With one Fox Peel set, the most basic skin care as well as individual solutions can be combined with other treatments for optimal treatment outcome. Fox Peel ACLESS can be used for acne care to tackle various types of acne including adult acne as well as to provide vitamin oxygen therapy. MELALESS and vitamin C oxygen therapy can be combined to clear pigments and MELALESS can be combined with laser toning in an effective whitening program. Image 1. Before and after whitening program. For anti-aging, AGELESS can be combined with vitamin C and oxygen therapy in antioxidant program. AGELESS can also be combined with lifting mask in anti-aging lifting program. It can be combined with HIFU for excellent benefits. In other words, Fox Peel can be customized to a wide range of skin types and conditions and tackles acne (ACLESS), whitening (MELALESS), and aging (AGELESS). Low molecule polyglutamic solution (amino acid compound created from glutamic acid’s g-carboxyl group and glutamic acid a-amino group bonding to amide) contains NMF (Natural Moisturizing Factors) and works to enhance other NMFs in the skin. It provides more effective hydration than hyaluronic acid and immediately improves the skin’s texture and appearance. Berry extract complex contains polyphenol, flavonoid, tannin, and organic berry acid. It has potent antioxidant action and provides skin protection, improved elasticity, delayed aging, cell activation, revitalization and skin tone correction. Image 2. 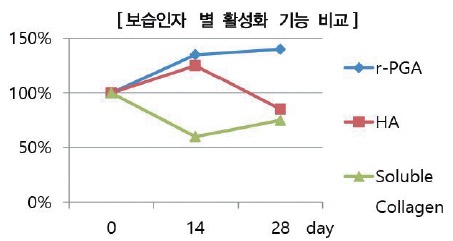 Comparison of moisturizing factor activity. Vitamin C is formulated in the powder form for better stability and provides potent antioxidant effect by promoting fibroblast activity and collagenesis. Fox Peel can provide a solution for all skin troubles. It does not require special post treatment care other than moisturization and sun block. It shows quick improvement after treatment and allows immediate return to normal daily activities. The skin can find effective remedy and relief from the harsh winter weather with Fox Peel with its natural, non-irritant ingredients and excellent benefits that can be customized to all skin types and conditions.